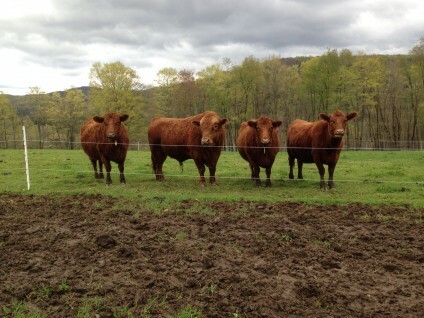 We are happy to announce that all of the bulls born at Fairsing have been purchased for breeding purposes. Thank you to our fellow farmers for their support and dedication to seeing the perpetuation of this wonderful breed. Click Here for a list of cattle sold. Fiona’s Ella, Red Heterozygous polled, June 3, 2018 SOLD! 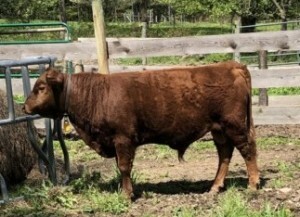 Precious’ Erin, Red Heterozygous polled, May 31, 2018 SOLD! 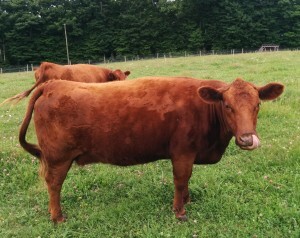 Autumn is a Red, heterozygous polled Dexter cow. She is carrying a calf sired by SugarP Rufus due in November. Autumn was born on Fairsing Farm. Her dam is FF Just Precious and sired by Belle Fourche Mr. Right. 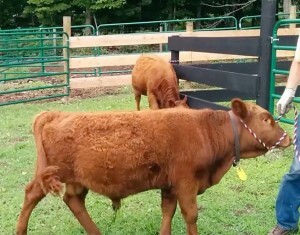 Fiona is a Red, dehorned Dexter cow. She has been bred to Fairsing Chanel’s Dutch (August 2018). She was bred by Warren and Sally Coad of Freedom Farm. His dam is FF Chanel and his sire is SugarP Rufus, field bred and born on the farm. Mark presents Lord Baltimore and Buster (SOLD FALL 2016). Sugar Buster SOLD 2016! Thank you to Chris and Katie Davis! Buster is a handsome even tempered young bull calf. Well balanced. Fairsing Lord Baltimore IS SOLD 2016! Thank you to Mike and Priscilla Maloy of Maloy Valley Farm! Baltimore is a handsome young fellow here shown at the feeder. He is wearing his winter coat. His dam and sire are both calm and very well put together: Barbie and SugarP Rufus. 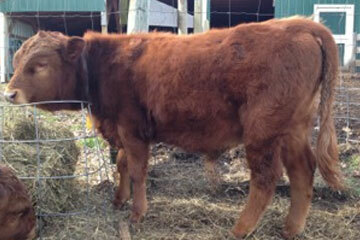 Adam is homozygous (Pc/Pc) red polled. He is a non-carrier of Chondrodysplasis as well as being a non-carrier of PHA. He was born October 14, 2014. His Beta Casein is A1/A1. His Kappa Casein is A/B and is Beta Lactoglobulin is A/B. His dam Barbie Doll is nicely straight legged with well placed teats.